Glenn Kenny's blog: Bought and paid for. What if you had a full-time job that you could get done in less than 40 hours a week? I've never really had one of those, but I've rarely had a 9 to 5 job, either. Most of my gigs (the ones I've really liked, whether writing for a daily newspaper or walking and boarding dogs) have averaged more than "full time" because the hours are not fixed -- that is, they are always in flux, somewhere between "flexible" and "unpredictable." In part, they involve being constantly "on call" -- available for unforeseen events. Drop everything: The death of a famous filmmaker requires a career-spanning obit/ tribute/ appreciation right now! A beagle with diarrhea demands comparably urgent attention, and a Great Pyranees with the same problem compels quick, decisive action no matter what hour of the day or night it is. There's no such thing as overtime (or "time off," really, either). That comes with the job. If you're David Ansen [the Newsweek critic who recently took a buyout offer], say, you might see three or four movies a week, and be asked to generate maybe a 1000 or 1500 words of unchallenging copy reviewing them, and the time thus taken shouldn't take you more than ten, eleven hours, max. That's a part-time job. I treated it, and continue to treat it, as just one part of my work-life and income, because I've had to. But when I was handed a staff position, I felt as if I was running a scam. All of the hubbub surrounding the firings and buyouts [of film critics] seems, from anywhere out there in the real world, like a lot of whining, about how certain writers won't be paid a full-on living wage for watching a movie a day and then writing for a few hours about them, every week. The cops, bartenders, union agents, managers, editors and public school teachers I know would look on that job as a vacation. Yes, and investment bankers and plumbers and travel agents and fighter pilots, too. But I don't think I could -- or should be able to -- get a job tomorrow as a cop, a bartender, a union agent, a manager or a public school teacher (I've been an editor for quite a few years). And I'm not sure how many people could suddenly begin producing readable or publishable movie reviews (much less actual criticism) tomorrow, either. So, what is the comparison? Everybody's a critic, I guess. Not everybody is a cop. Now, I've never had to support myself by working at a weekly or a monthly, and I don't know what Atkinson's situation was at the Voice, but if all he had to do as a staff critic was see "three or four movies a week" and then knock out "1,000 or 1,500 words" (apiece? altogether?) -- and he could live on the money he made from doing that -- then, wow, that's a really sweet gig and I don't blame him for feeling that he was running a scam. Somebody was. Because, in my experience, those numbers don't come close to adding up. Three or four movies a week wouldn't even cover major-studio wide releases. Who covers the rest (four? eight? a dozen?) for the week, the "art house," revival house, museum and nonprofit venue pictures that rely on reviews to find an audience? And since when do writers of any kind get paid by the hour? You're cashing checks just for the time you spend actually sitting at a keyboard, but for all the things you have to do in order to enable you to write. So a salary for a writer, reporter and/or film critic (and all three job descriptions fit the "critic" designation) isn't exactly an hourly job, nor is it the equivalent of tenure. It's more like a retainer, for your work and what goes into producing it, but also for your availability. What's actually published is just the tail end of a much larger and longer process. True, freelancers usually get paid by the word, but as any editor will tell you, that can be a little like paying a cab driver to take the longest route. (Think it's harder to write 1,000 words than 500 -- or 5,000 words than 1,000? It's not.) Besides, it's the quality of the work, not the amount, that matters, isn't it? Words are cheap -- you've got to chose the right ones and then get them all in the right order, as John Cleese once said of memorizing Shakespeare. Oh yes. Editorial meetings. Fielding and making story pitches. Balancing screening schedules (don't laugh -- that can be tricky). Actual editing and fact-checking (newspapers don't have a separate staff of "fact-checkers"). Doing interviews (arranging, researching, conducting, transcribing, writing, editing -- even a straight Q&A isn't finished when the talking's over). All the research -- conversations, reading, viewing -- that goes into working a reporter's beat. And, of course, there are those inevitable last-minute surprises: "We need a piece about why 'Speed Racer' tanked over the weekend"; "I think this piece needs to be re-structured"; "We need to cut six inches from that story because we just got an unexpected ad"; "We need to cut six inches from every one of your reviews because the movie section just got cut back four pages"; "We had a 12-inch hole for that review, but now it's only eight"; "Because they're not screening it, we need you to go to a Friday matinee and file immediately for Saturday's paper"; "They've changed the release date -- that movie's opening this Friday, not next week"; "It's now opening on Wednesday, not Friday"; "Three more are opening this week"; "That review you just filed -- um, the movie is now opening sometime next year..."
Wah, wah, wah. It's a great job, it never ends, and (as we should constantly remind ourselves) those of us lucky enough to have one are mighty fortunate. 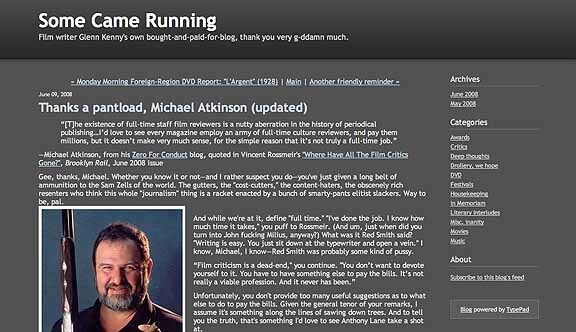 I've written plenty about the exaggerated influence of movie criticis, and about why I think criticism is an essential part of our cultural life (immeasurably enhanced by, but not limited to, contributions by freelancers and bloggers). But all that aside, if you find somebody's writing valuable, what's wrong with a little appreciation and human empathy (hell, even sympathy) when he or she gets squeezed out of a job? Cops, teachers and bartenders stand up for the good ones in their professions when they go through hard or uncertain times. Why shouldn't critics?